Of course this being a leak and especially with no official releases for the 9700 yet, it's to be expected there to be some bugs. 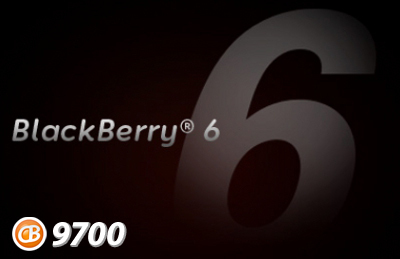 In my opinion however, they definitely outweigh all of the functionality that comes with BlackBerry 6. As a heads up, some of the things I mention will likely overlap with Kevin's review of BlackBerry 6. His guide is very extensive, however I'm writing here more-so about my experience with the leak on the 9700 and what's impressed me the most in comparison to OS 5. 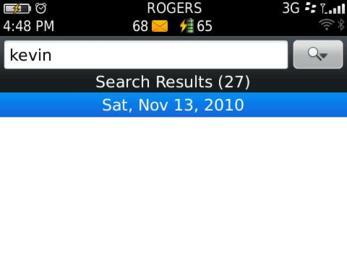 I have found the battery life to be at least twice as good as it was on OS 5 when my BlackBerry is idling. 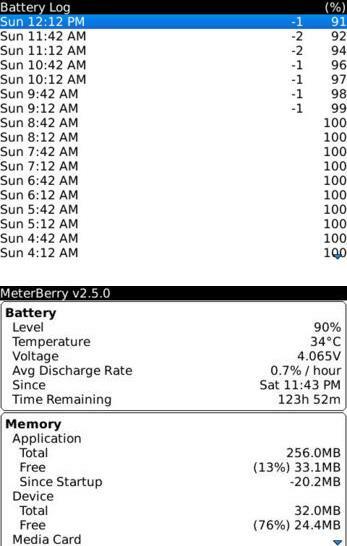 While using MeterBerry, I can see it dropping at around 1% per half an hour, where-as it used to go down no less than 2% per half an hour on idling, with the same apps installed & running. I've heard of some people having issues where the battery level suddenly plummets at 35%. What I have read on the forums is that it would drop to 8% right after it display 35%, and sometimes the BlackBerry would die shortly. I personally have not experienced this issue. Even when I am using my BlackBerry to listen to Podcasts throughout the day, it still lasts my the entire day without topping up, where-as lately with OS 5 I was having issues with it dying much faster than it used to. I purchased a new battery, and that didn't seem to help much. When I initially started using BlackBerry 6 on my 9700, the first thing I noticed was that the Universal Search was on by default on the home screen, and it seemed like I had lost all my keyboard shortcuts that I was so used to using off of the home screen. For example, to go to Messages, I was used to pressing the "M" key which would send me there. I later found out that this is an option that is changeable by pressing the BB button on the home screen, selecting Options, and changing the "Launch by Typing" option to "Application Shortcuts." I found Universal Search to be very useful where unlike in BlackBerry 6, it will search all parts of your BlackBerry with one shot (I'm talking Podcasts, contacts, both local & remote messages/e-mails, music, options, 3rd party apps, YouTube, etc.). 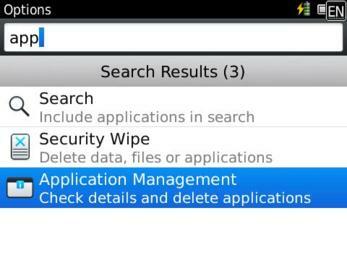 I'm really digging the search as you type that works for a good amount of the Core apps of the BlackBerry. When you want to change an option, all you do is go to options, type a part of it, and you are shown where that option is. No more having to dig through to find where the option you want to change. Pulling up Manage Connections from the main screen has been a dream of mine ever since I laid my eyes on BlackBerry 6, and now that I've seen it I'm even more impressed. Aside from it being so easily accessible by clicking on the top item of the home screen, it's got added functionality in BlackBerry 6 such as setting the alarm clock and Options. While I'm not a huge fan of social apps, I tend to be a fan of RSS. The RSS portion of the Social Apps offered with BlackBerry 6 work pretty well, however at this point when clicking on "View Full Article," the page never comes up. As well, it lacks the ability to see which RSS feeds have been read, which I'm hoping RIM is working on improving. 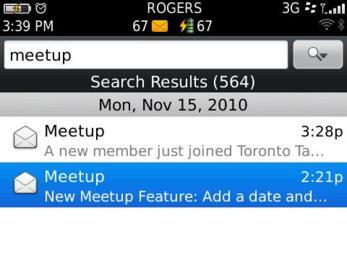 While going through the CrackBerry forums, I've heard several people mention a memory leak. I had an interesting experience recently where I was using MemoPad for an extended period of time, and my Storage Memory went down the drain. You can see the start of it on the screen capture below made from the Internals app. 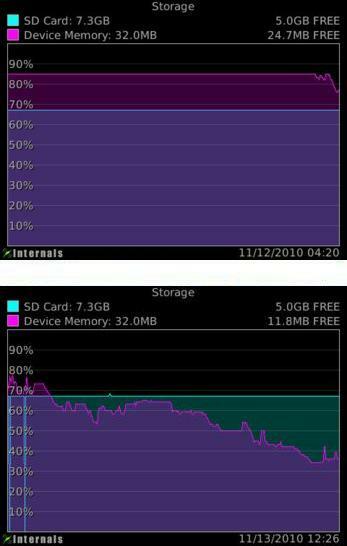 The device memory signified in purple is definitely dropping significantly, where-as in OS 5, I always had it sitting at the top at 32MB, close to 90%. I've also heard throughout the CrackBerry community that there are specific 3rd party apps that area causing the memory leak, but I haven't come across any such apps myself. So with that in mind, I am only going to mention to watch out for it, as it does appear to be out there. Over-all, the browser works better than in OS 5. When downloading through it, to my amazement, the downloads fly. I was under the impression that the downloads on OS 5 were slower due to data speed limitation, but boy was I ever wrong. 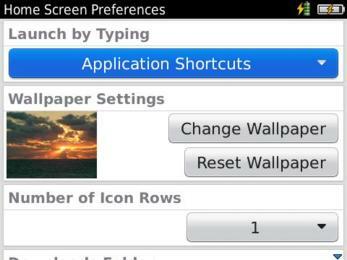 One thing that I initially thought was missing when I started using BlackBerry 6 was the shortcuts on the browser. With the help of the CrackBerry forums however, I realized that there was an option within the browser to enable the shortcuts. Keep in mind that the new Webkit browser is missing emulation mode, which I am hoping they're working on, as otherwise it's likely to send users back to 3rd party browsers for those sites they want to see in full mode that aren't given the choice by the website itself to switch back & forth. The calendar looks different, and initially, I was led to believe that it was no longer possible to swipe the trackpad to the right for the next day in day view, and to the left to view the previous day's events. I recently realized that the swipe required for this is much more extensive than before, as you need to nearly swipe your entire numb in order to get to the next/previous day on day view. 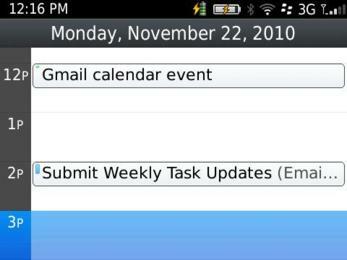 Aside from that, I have mixed feeling about the way the coloured highlighting works for the new calendar to separate between the different calendars you have (I have Desktop, Gmail, and BB for BlackBerry.net account). In the image below, you can see how hard it is to view the green on "Gmail calendar event" without highlighting it. 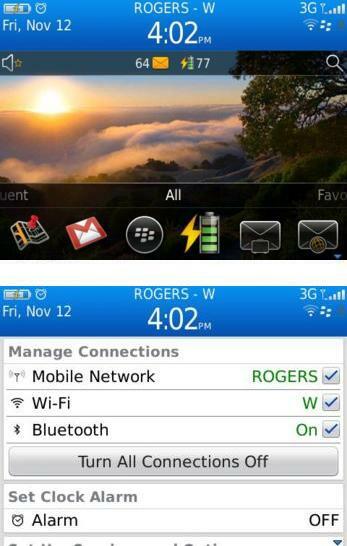 Regardless, I've found that all apps that working for me on OS 5 are working fine for me on BlackBerry 6. The only problem is that some are not working the same. 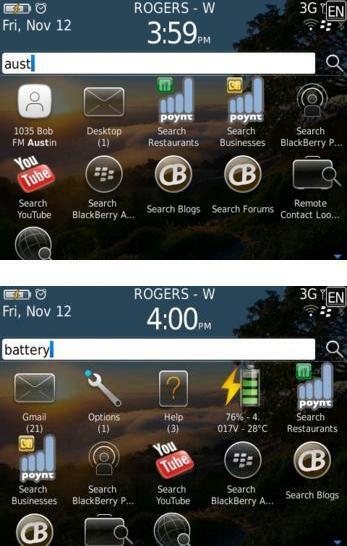 An example would be BatteryEx, which displays a battery icon with the percentage of battery left. It only seems to work on my home screen, and not on anywhere else within the OS. It's nothing I can't live without, but it just means I have to go back to my home screen to check my battery level, which I tend to do constantly. The new ringtones that are included with BlackBerry 6 sound very clean and all-in-all in my opinion aren't bad at all. However there were a few that I missed, especially considering I have at least one that I used on my OS 5 off of the BlackBerry 4 OS. 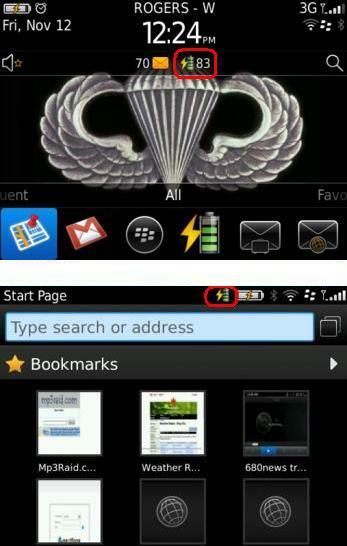 So I noticed with the help of the CrackBerry forums that it's possible to take the old ringtone COD file, and install it on your BlackBerry on BlackBerry 6. The post I found suggested re-installing the OS, but I managed to do it using BBSAK. I noticed that when I have the emoticons menu open within BBM for example, and I scroll down to the bottom, my cursor stops after hitting the bottom. With OS 5, after hitting the bottom in the emoticons window, it would start scrolling to the right. It's more of a minor thing, but it was something I was used to that's for some reason no longer available. At this point, Theme Studio doesn't support any device other than the Torch 9800. I'm anxiously awaiting an update of it to come out, so that I can either find a theme with a weather slot or try making one myself. BerryWeather doesn't work the way I like, and I've always found it extremely convenient to take a glance at my screen to see what the temperature and current weather conditions are within my area. So this is one down side of playing around with this leak, but truth be told, the factory theme is quite more functional than most OS 5 ones I've tried, so I'm personally fine living with this limitation at this point. Keep in mind that there may be certain bugs that I haven't experienced or yet noticed that others may find, so this section is only as complete as I could make it. Have you tried installing the leaked version of BlackBerry 6 only to find out that you're stuck in a white screen with barely anything visible on it? The problem is that this leak seems to only have been designed for a handful of carriers, and they are the ones that a theme has been assigned to. 1. Press ALT + SHIFT + H, and note your "vendor ID" from that page (mine's "102" for my BB from AT&T). 5. Now take the vendor ID you looked up in step 1. Since my vendorid is 102, I changed 100 to 102 and saved it. The comes up with an error saying the page was too large to be displayed. When you click on the only option available "OK," the browser closes and re-opens, losing all your tabs you had open. Then if you try opening the same page again, it will load fine. I like to scroll page-by-page using the space key. The problem I've noticed here is that when you are at the part where you're like to click on a link and you try scrolling up using the trackpad, the focus of the message jumps way down. The work-around I've found for this is scrolling back up with the trackpad up to the desired area and highlighting the link that way. The copy function within the address book does not appear to place the text you're attempting to copy in the clipboard. The work-around I've found in the CrackBerry forums is doing a Universal Search for the contact, where it will allow you to do the copy of the relevant information (eg. a phone number from a contact). I've found that when you already have Messages open and you get a new e-mail for example, when you highlight the new e-mail and try opening it, you get the previous e-mail that opens up. Closing and re-opening Messages seems to solve this. Also sometimes when I open my Messages with a new e-mail that has arrived, I've found that the highlighted area is in between the date & the top message. Closing & re-opening Messages also solves this. When you're in a conversation on BBM and you want to see how long ago a message was sent above or you can to copy a part of a previous message within the conversation, you will find that when scrolling up, the cursor disappears. When you scroll back down, it only re-appears when you're back in the typing area. The only way that I've found to work around that is by slowly scrolling and seeing the difference in the "Sent @ (...)" or "Received @ (...)" label below the contact's name at the top. When you're in Messages and you want to do a quick search, you can pressed the "S" key on your keyboard, and a little search box will come up at the top. The problem is that the results search you run from there do not show up. Only the date of what seems to be the latest of the search results will show up. The work-around I've found for this is doing an Advanced Search instead. Something related is when searching using the Quick Search within Messages, numerous results are found as per the number within the brackets, yet only a few will show up (in the example below, only two show, with results of 564 messages found). Yet another issue I'm now having issue reproducing. None-the-less, I'll explain it anyways as I've experienced it more than enough times to mention it here. After successfully doing an Advanced Search within Messages, I would press my Back key. At this point, I would also see a screen-full of messages, and no longer be able to scroll beyond that. The work-around I found for this is going to the mailbox's respective icon (for eg. "Gmail") to see beyond the view it would allow me to see. Eventually this has been clearing on its own without doing anything, so it's almost as though the BlackBerry is trying to process something within Messages during this time. So you've set up your RSS feeds within Social Apps. You go to read one of the posts that you liked, so you open it. You see nothing within the contents, and no sign of anything happening. After at a duration ranging from 10 to 30 seconds, the summary appears. I'm not sure if this is a bug or just the way the app works, but it really feels like a lot longer while you're sitting there all anxious waiting for the summary to come up so you can see if you want to read the entire story. 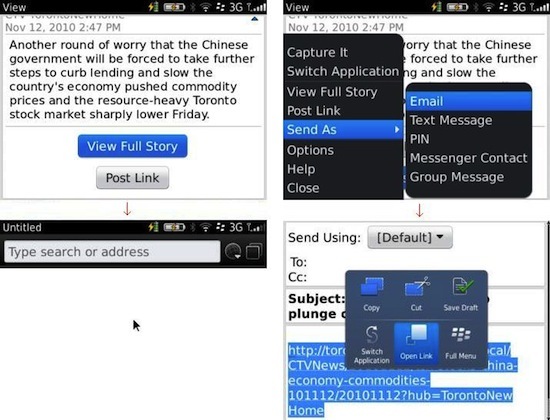 Before describing this issue, please keep this in mind: Depending on the RSS feed source, what I'm about to describe might not be an issue as it reads the links from within it (CrackBerry's RSS feeds work rather well for instance). I've even noticed that the "View Full Story" works for the CrackBerry RSS feeds, but not for most of the other RSS feeds I've been using. Once you're done waiting for the summary to load of an RSS feed after you've opened it, you might want to read the full story. You click on the "View Full Story" button, and all you get is the browser open with nothing within it, as if you just opened the web browser for the first time after booting your BlackBerry and are about to start working with it. The work-around I've found for this is pressing the BB button, clicking on "Send As", selecting "Email" and opening the link that shows up there. While launching Manage Connections from the home screen by clicking on the top of the home screen (where the carrier, time, etc. is found), the highlighting of the item you'd like to select disappears when attempting to scroll up & down. The work-around I have found for this is by closing and re-opening Manage Connections until the highlighting re-appears (sometimes it takes several tries). I've become rather accustomed to scanning QR Code barcodes off of my computer's screen with the barcode scanner that comes with the latest versions of BBM. It still works fine for barcodes that are linked to BBM contacts & groups, however when attempting to scan ones related to URLs, it does nothing but beep. Originally it would open the respecting website. I also like to create my own barcodes, as I find it to be one of the fastest ways of opening an OTA link on my BB that I've found on my computer's web browser, which makes this that much more of a bummer for me. If I had to guess, I'd think that this is related to the Webkit Browser that hasn't been developed yet to work with this functionality. The work-around that I suggest to this is e-mailing yourself the address in question or if you're on BES, creating a note within Outlook and then opening it on your BlackBerry after giving it a minute or two to sync. Yes, there are some bugs with the leak, but all-in-all, I definitely recommend giving it a go to see if the advantages of BlackBerry 6 outweigh the bug, as they do for me.